Boss, we need more RAM! | This Is Finda! Above, is a screenshot I captured this morning, the same firefox process as I am typing. People say a picture worth a thousand words, so I think the screenshot above tells it all. To let you have a fair judgement, I have vimperator and firebug installed, with ONE tab open. I left my computer running in the office over the long weekend. I think the problem is one line below…. Bro… You’ve GOT moar RAM! Didn’t I just organise you 6Gb of pure pleasure? What was that about Google Toolbar? 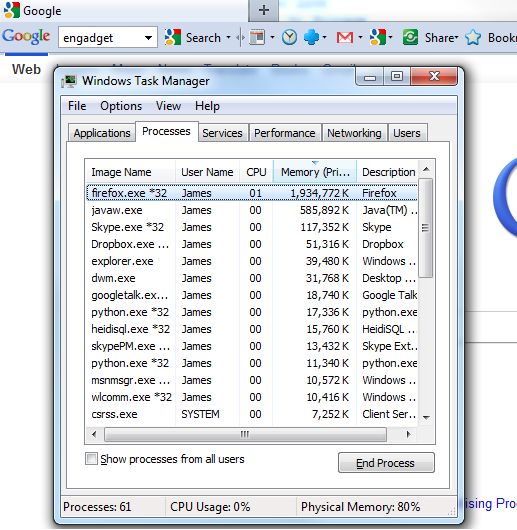 Just upgraded to firefox 5.0, been using it for the whole morning, memory is kept under 250MB. Not too shabby! However, I only have vimperator running, so I can’t garantee if the memory leak has been fixed or the addons(firebug & google toolbar) should be blamed.